If you are searching a simple and effective way to support the protection of the wildlife, the World Wildlife Fund BankAmericard Credit Card can be a good option for you. The application process is very easy too and can be done entirely online. For detailed information on it, make sure to read our guide below. Step 1: Navigate to the card’s main page and press the ‘Apply Now’ button. 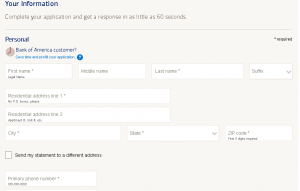 Step 2: Provide all the required personal information including your: full name, valid mailing address, and valid phone number. 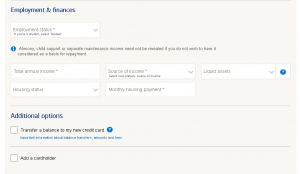 Step 3: Enter your financial information under the Employment & Finances section, including your annual income, source of income and your monthly housing payment. 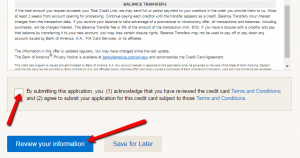 In case you would like to transfer your balance to your new card select the ‘Transfer a balance to my new credit card’ under the Additional options section. Step 4: Read carefully the Terms & Conditions and check the box under this section to submit your application (in doing so you agree to the conditions introduced in the Terms & Conditions section for this credit card). Finally, click on the ‘Review your Information’ button and you will be able to submit your application for your new card. Q: What is World Wildlife Fund? The World Wide Fund for Nature is an international organization which was founded in 1961, with the aim of the wilderness preservation, and the reduction of human impact on the environment, especially on oceans and coasts, forests, and freshwater ecosystems. Its previous name was the World Wildlife Fund, which remains its official name in Canada and the United States. The organization has over five million supporters worldwide, working in more than 100 countries. WWF is concerned with endangered species and climate change so WWF's giant panda logo originated from the only panda that was residing in the Western world at that time. 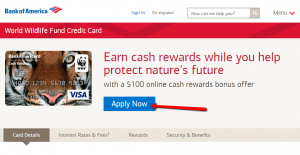 Q: Does the World Wildlife Fund BankAmericard credit card has any fees? No, the World Wildlife Fund BankAmericard credit card is great if you want to customize your spending details since it is a no-fee card. Also, you do not have to earn a certain amount of rewards in order to cover the cost since it is free. Q: Does the Bank of America give some percentage to the World Wildlife Fund when the World Wildlife Fund BankAmericard credit card owners use this card? Yes, with the usage of World Wildlife Fund BankAmericard credit card, you support the World Wildlife Fund meaning that the World Wildlife Fund will receive $3 when you are approved for the card and at least $3 every year when you renew the card.